In the day's final central bank announcement, the ECB followed in the BOE's footsteps, if not those of the CBRT which delivered a shocking rate hike surprise, and kept rates unchanged as expected while forward guiding that it expects to keep rates "at their present levels at least through the summer of 2019, and in any case for as long as necessary" a repeat of recent language. 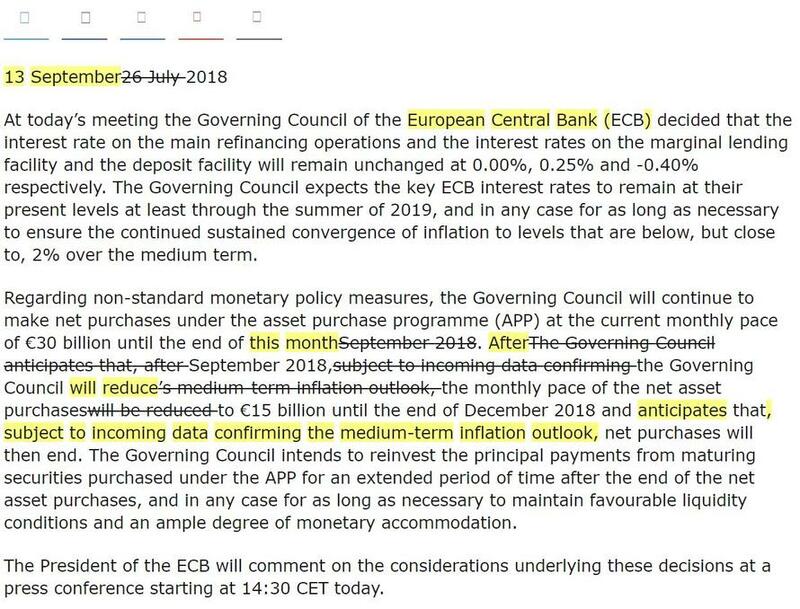 In terms of the timing of the ECB's QE unwind, there were no surprises either, with the central bank repeating that "after September 2018, the Governing Council will reduce the monthly pace of the net asset purchases to €15 billion until the end of December 2018 and anticipates that, subject to incoming data confirming the medium-term inflation outlook, net purchases will then end"
Overall, a snoozer of an announcement, with no notable reaction in the EUR or other asset classes. While no fireworks are expected either from Mario Draghi's press conference at 8:30am, look for the ECB to cut its GDP forecasts, discuss the current situation in Italy and deflect questions about the ECB's reinvestment policies as previewed earlier.